Vango says:"The Vango flagship range of sleeping bags. Following the principals and practices of all Vango products, the Vipers live up to and beyond expectation in terms of quality and performance. Go High. Go Viper." Zip guard reduces risk of 'zip jam'. Vango describe the Viper 750 sleeping bag as a '4 season' bag (in line with the industry standard) and it certainly performs very well. 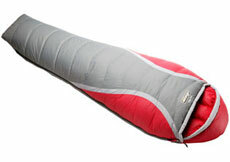 Tested on a very cold trip to a snowy Snowdonia I was both warm and comfortable in this 'Mummy' style sleeping bag. My feet had plenty of room as did my head inside the hood, and the generous baffles formed good closure around my neck to keep all the heat in. The two-way zip is robust and sure and ran smoothly and the close stitching and overall finish were of high quality. As with all Vango Sleeping Bags, the stuff sac is well designed with 4 zip lock compression straps so stowing the bag into its stuff sac is quick and efficient. The Vango Viper 750 is an excellent sleeping bag that will keep you warm through all but the harshest UK nights. Great colour, perfect for 'camping by car' and at 1600g just about light enough for backpacking.